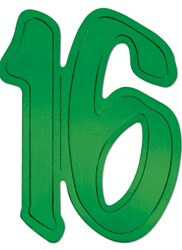 Add some color to your birthday when you decorate with the "16" Foil Silhouettes. These silhouettes come in bright blue, red, green, yellow, orange and purple so they match perfectly with the "16" Whirls. These '16" Foil silhouettes will also add some shine to your sweet sixteen decorations with their metallic coating. Another plus is that these silhouettes are twelve inches (1 foot) tall! So your guests will be able to see them wherever they are standing. Unfortunately, you cannot specify colors, but will receive a variety if you order more than one.